The popularity of Destination Weddings has exploded in recent years with dozens of weddings happening on the sand around the Caribbean & Mexico daily. More and more brides are coming to us wanting something different… wanting to take the uniqueness of a Destination Wedding to a new level. 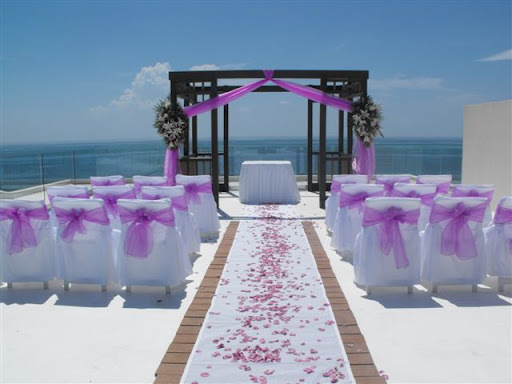 One such recommendation we have is to book a Sky Wedding at Azul Sensatori or Azul Beach in Riviera Maya, Mexico. Imagine exchanging vows perched above the pool, gardens and beach – a setting unlike any other in the world. Signature Sky Weddings are hosted on a private rooftop terrace with glorious views, especially at sunset. For the formal ceremony, there is a wooden canopy structure facing the sea for you to personalize with your own themed color & other decor. Glass panels top the partial walls to block any wind. Your guests will be greeted with a cold, scented towel and a welcome cocktail. They are given a fan and personalized program with a photo of the Sky terrace for the ceremony. A wedding webcam provides live Internet broadcast of the ceremony back home to friends and family (max 20). Drinks for your celebration toast are presented with white glove service. You’ll get a silver photo frame as our gift. • Guests: Up to 80 people at Azul Sensatori. Up to 65 people at Azul Beach. • Includes the services of our U.S.-based Advance Wedding Planner and On-Site Wedding Coordinator. • Rooftop terrace is accessible only by elevator plus a flight of stairs. Cancun is a great destination for a wedding because the airport services international flights from all over the world on every major airline. Delta Airlines, and many others have daily nonstop flights.